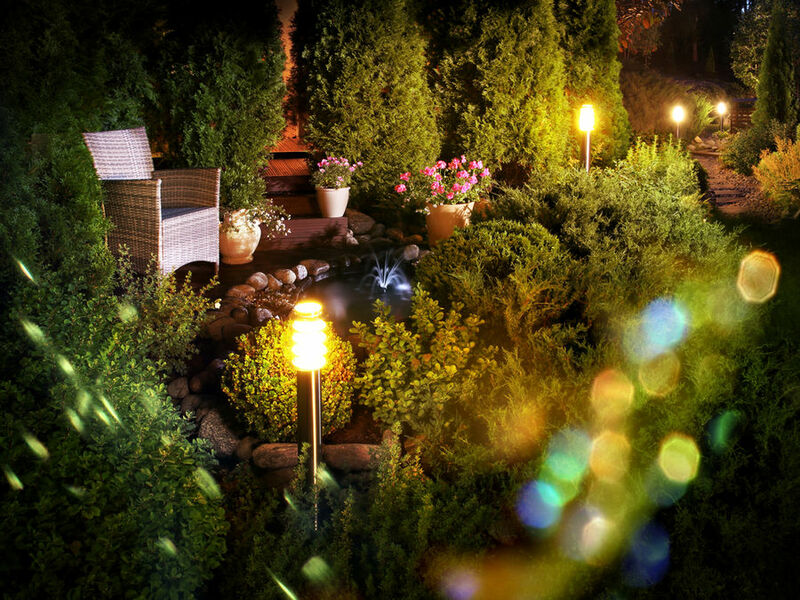 Small gardens definitely have their advantages, but when it comes to designing them you might struggle to fit it all in without overcrowding, but with the right outdoor lighting you can transform the area into somewhere you’ll love to use. There are certainly steps you can take to lighting a small garden to ensure you get the most from your space, alongside design tricks to make the space look bigger too. They say good things come in small packages, so there’s no reason why your small garden can’t be somewhere that you love and cherish, and just think it’s a lot less upkeep and maintenance, and you’re likely to spend less lighting and designing it too. This is our lighting guide for small gardens with tips on the types of lighting you might want to consider in your space. Solar stake lights in the garden are a great option because they’re flexible, so you can move them around with ease, and they’re incredibly easy to set up and use. If you change your mind, or would like to bring light to a different area you can easily move them around the garden, maybe to highlight a new plant, or bring more light to an area when you’re entertaining. Solar stake lights definitely make a great option for every type of garden. If you manage to make the space for some decking in your garden, choosing recessed deckling lights is of course the best option because they’re simply hid away on the floor of the decking. They’re handy to provide a light path through the decking area, and add a safety feature to your decking too. Wall lights are a great option for small gardens, simply because they won’t take up any floor space. You can position them along your walls to provide some illumination, and if you choose a sleek fitting, like the Thames Outdoor Wall light, they can look pretty inconspicuous too. These wall lights are a great option, especially if you have a seating area right outside, as you might not need to consider any other lighting for further into the garden. Fairy lights are great because they create a beautiful ambient atmosphere in the garden, and they can be used pretty much anywhere in the garden. Use them to line plant pots, a garden arch, or hang them from a tree. Anywhere you put them they’re going to look sweet and appealing. They provide delicate light in specific areas, and are great for ensuring your small garden feels cosy. Like the wall lights, hanging lights are a great choice because they won’t take up any room from the floor. Instead you’ll be able to hang them from fixtures around the garden, and provide a splash of light in the whole area, or where you’d like it. If you’re having a table in your garden, you might want to consider some lighting for this area. Small solar table lights are great because they’re portable, and they often come in fun designs which make an interesting centre piece for your table. You might also prefer to use candlelight for when you’re sitting at the table, similar to the fairy lights these will add an ambient and soothing effect on your garden space. Plus, if you use a citronella candle in the garden, you’ll keep away the bugs and flies, which is always a huge plus. You might want to line your fences with some type of outdoor strip lighting to help highlight your whole garden; this is particularly good if you find your garden is shrouded in really dark spots. Using this type of lighting will act as a security feature in the garden too. If you choose to make plants a statement feature in your small garden you definitely want to show them off, and up lights might be the best way to do this. They highlight the plants beautifully and because the light will be diffused more evenly it’ll help to create an ambient and cosy look to your garden; as well as showing off the gorgeous plants that you’re likely to be spending a lot of money on.